Comments: I had been experimenting with new (drift) polar alignment techniques and this was my first image after the new setup. The Sunflower Galaxy (also known as Messier 63, M63, or NGC 5055) is a spiral galaxy in the constellation Canes Venatici consisting of a central disc surrounded by many short spiral arm segments. The Sunflower Galaxy is part of the M51 Group, a group of galaxies that also includes the Whirlpool Galaxy (M51). The Sunflower Galaxy was discovered by Pierre Méchain on June 14, 1779. The galaxy was then listed by Charles Messier as object 63 in the Messier Catalogue. In the mid-19th century, Lord Rosse identified spiral structure within the galaxy, making this one of the first galaxies in which such structure was identified. 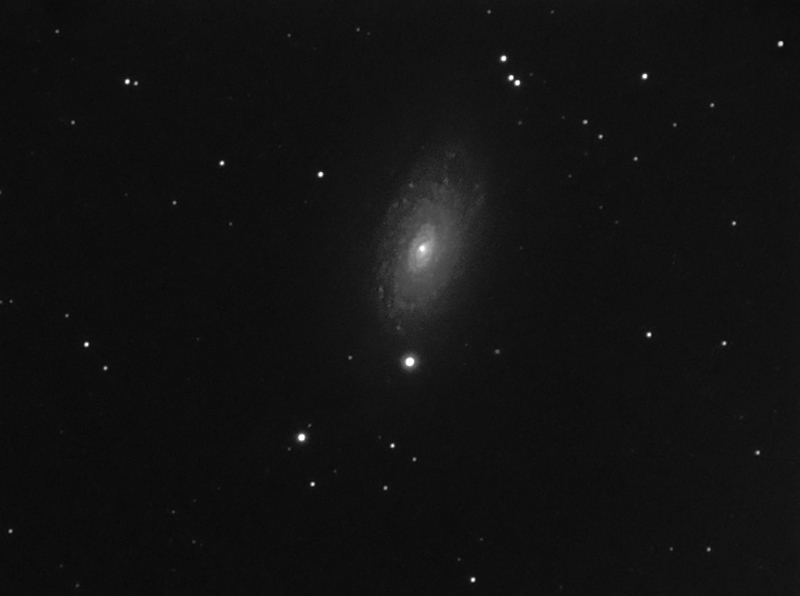 In 1971, a supernova with a magnitude of 11.8 appeared in one of the arms of M63.